The 2nd video above features Daniel Woods running a lap on Terre de Sienne, a Fred Nicole problem on North Mountain that was long registered as V14 by repeaters who maintain 8a scorecards. That has changed though as both Daniel Woods and Paul Robinson adjusted their respective scorecards at some point to change the grade of this problem to V13 with Robinson commenting “def not 8b+ (V14)”. On a related note, Canadian Simon Parton just pulled off a really impressive 2nd try ascent of Terre de Sienne according to 8a.nu. 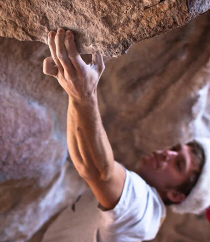 Speaking of Daniel Woods, he’s been busy adding V13s to East Mountain according to his 8a scorecard with the first ascents of Yellow Diamonds near the Dragon’s Den and Carol of the Bones near Slashface. DPM has a few photos of the latter problem here. Brian Antheunisse had an excellent week recently in which he sent 4 V13s: Full Throttle, Coeur de Leon, Diabolique and Nagual. Sam Davis was on hand to capture a few photos of Phil Schaal sending Slashface (V13) and Antheunisse’s aforementioned send of Full Throttle. And in news that is interesting because of the age of the climbers, 36 year-old Jan De Smit sent Diabolique (V13) and 14 year-old Liam Vance sent El Techo De Los Tres Bs (V11) and Diaphanous Sea (V11/12). Why is a V13 send news-worthy because the climber is 36? There are plenty of “old folks” climbing at least that hard. I assume it could be difficult to get a wheelchair to Diabolique. I remember in 2005 when Fred climbed Terre De Sienne, it was originally V15, funny how it has come down 2 full grades. Still a really cool line though! how do i access these videos? i couldnt do it in the font post either…am i missing something here? Do they not show up for you or what is happening that you can’t access them? they are all just stills about the same size as a vimeo screen? i need my font dose!!!!! help!!!!! haha. Do you have a Flash-block plugin installed in your browser? Another option is to go to the video directly, then select the HTML5 player. Weird. It works fine for me in chrome. If you figure anything out let me know in case it’s something wrong on my end. Pat C, I believe that Fred used slightly different beta for the feet, which may have influenced his thoughts on the grade. I am not sure how different, but I think that he did not use the big dropknee that you see Graham using in Dosage 4 when attempting terremer. I thought I remember pics of him doing it the same way that DW does it in Jimmy Webb’s video, going left hand first. I was actually in Hueco that winter in 2005 and talked to Fred about it, he didn’t seem to care much about the grade, he was pretty psyched on the name of the climb though. Don’t you feel like a part of Nicole’s legacy has to be his names for his problems? They are generally quite interesting. Or at least as interesting as the name of a sequence of moves on short rocks can be. For sure Narc, he said Terre De Sienne was a colour he was painting with lately. definite possibility when you see those holds! that a Pat made??? A Patocalypse of gargantuan proportion? you have Babelfish for that!